Independent of each other, guacamole and hummus are the primary dip recipes in their respective cultures. Our unbelievably creamy avocado hummus recipe blends the best of both worlds with chickpeas, tahini, lemon, and lots of avocado with the fresh herbs and spices. Guacamole can be added to any protein kicking up the flavor factor big time. This avocado hummus makes perfect sense when you think about it: Two amazing dip recipes joined together in a single bowl. Avocado lovers may never go back to plain hummus after tasting this addictive version! 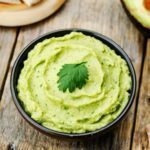 This creamy Avocado Hummus recipe blends chickpeas, tahini, lemon, and lots of avocado with the fresh herbs and spices that make guacamole irresistible. Place chickpeas, lemon juice, oil, and garlic in food processor (or blender) and pulse until chickpeas are mashed. Add tahini; pulse for 1 minute. If hummus is too thick, add some of the reserved chickpea liquid. Season with salt and pepper if desired. Add avocados and cumin; pulse until mixture is smooth and creamy. Add raw dipping veggies to make this a great snackional.